Gary Hart was a U.S. senator from Colorado who twice ran for president of the United States. He lost the Democratic primary to former vice-president Walter Mondale in 1984, but in 1988 he began the first few primaries with a commanding lead over other contenders, including eventual candidate Michael Dukakis and future vice-presidents Al Gore and Joe Biden. 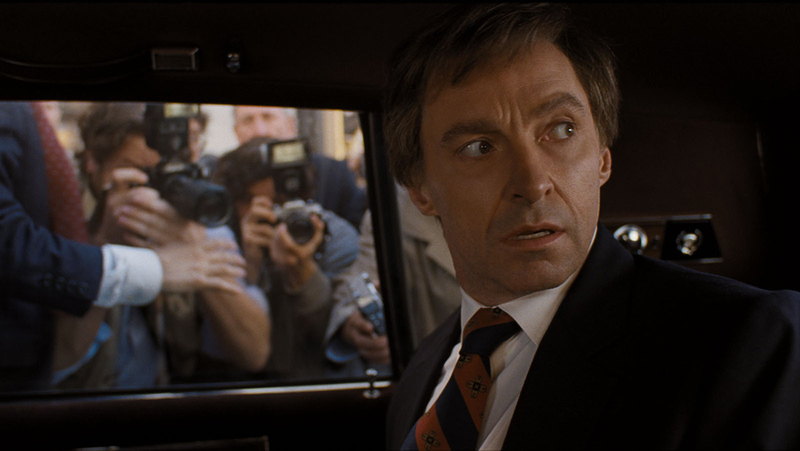 Jason Reitman’s new film “The Front Runner” examines what went wrong with Hart’s campaign. Why did it dissolve, ruining a once very promising career? We all know Hart’s crusade was brought down by his extra-marital affair with marketing representative and former Miss South Carolina Donna Rice – a liaison not from Hart’s distant past, but that occurred during the campaign trail. Reitman’s film lays as much of the blame on the tabloid media as with Hart himself. And Hart’s responsibility, per “The Front Runner,” would appear to be more his handling of the aftermath of the affair rather than the affair itself. The always reliable Hugh Jackman plays Hart – although he doesn’t look any more like Hart than Anthony Hopkins resembled Richard Nixon. And he plays Hart exactly as we remember him – always on topic; eager to discuss public policy; loathe to discuss his personal life. Hart’s appeal was the fact that he had opinions on absolutely everything – the economy, foreign affairs, jobs, the stock market. Heck, the guy was a policy junkie. And he’d give credit where credit was due. In “The Front Runner,” we see Hart chastising President Reagan for certain aspects of his economic policy; then five minutes later, we see him credit the president for his ongoing negotiations with Soviet premier Mikhail Gorbachev. But we also wince every time Hart is asked even a simple question about his wife or children. As with any public figure, his desire to distance his family from the spotlight is commendable, but Hart takes it too far – lashing out at a journalist for having the gall to ask him to describe a typical day in the life of Gary and Oletha “Lee” Hart (Vera Farmiga). Most politicians would have gladly answered, albeit not willing to reveal much in the way of fine details. Hart would chastise the individual who asked the question in the first place. This self-inflicted distance Hart placed between himself and the media was perhaps in part responsible for the Miami Herald’s sloppily-executed stake-out in front of Hart’s Washington D.C. townhouse, in which they captured exclusive photos of Hart and Rice leaving and returning several times. When the story hit, Hart’s campaign was never able to recover, and he suspended his effort just a week later – again unable to convince the media to cover his stances on the issues of the day rather than his personal dalliances. While the overall effect of “The Front Runner” is that it’s now quaint to witness how something as commonplace as an extra-marital affair had the ability to fell a campaign as recently as 30 years ago, the lasting impact of Reitman’s film is that it never rises above the level of a TV movie of the week. To wit, the Washington Post (by 1988, a rival to the New York Times as the most respected newspaper in America) is presented in a paint-by-numbers fashion in “The Front Runner.” Unlike the energy and electricity bestowed upon Post journalism by Steven Spielberg in last year’s “The Post,” here newspaperman Ben Bradlee (Alfred Molina) is seen advising his writers, including Bob Woodward (Spencer Garrett) how to best cover the burgeoning Hart/Rice story – but without the passion Tom Hanks gave the Bradlee character in Spielberg’s film. Where “The Front Runner” succeeds is in its portrayal of Donna Rice. Played by Sara Paxton, Rice is a confident professional and Phi Beta Kappa – but she’s at a loss as to how to handle the media attention. While Hart is a seasoned professional, with a team of handlers (including the great J.K. Simmons) who regularly shuffle him through the throng of media so quickly he doesn’t have time to answer their quandaries, Rice is seen descending a hotel escalator into a circus of reporters. The look of fear and uncertainty on Paxton’s face speaks volumes. If we could see the face of Jesus surrounded by the lepers and beggars in Jerusalem during Holy Week, Paxton exactly captures that look. And the Hart campaign does nothing to help her navigate the slippery slope of handling the media. Unspoken at the ending of “The Front Runner” is the obvious conclusion that in just four years, Americans would elect a known philanderer who kept up his extra-marital relations during his eight years in the White House – not to mention the even more blatant affairs of its current occupant. But Bill Clinton had the innate ability to shrug off – heck, even make light of – the tabloid media response to his every liaison. His “aw shucks, you caught me again” attitude played well with middle America; and let’s face it, we are all flawed in some way. While Clinton played off his imperfections, Hart was always unable to do so. “The Front Runner” accurately captures this character trait (or flaw, as some might suggest in retrospect), and while the overall effect of the film is just “average,” we are saddened to see that Hart’s rigid personality prevented him from ascending to the highest office in the land. He could have been one of our finest presidents, per Reitman’s film. But we’ll never have the opportunity to find out.